What's one billion users when you can go after two billion? Facebook announced on Monday a slimmed down version of its popular messaging app called Messenger Lite, designed for users with slower internet speeds in emerging markets. The app caters to lower-end Android devices and takes up as little as 10 MB on smartphones and tablets. Facebook's standard Messenger app requires 125 MB. 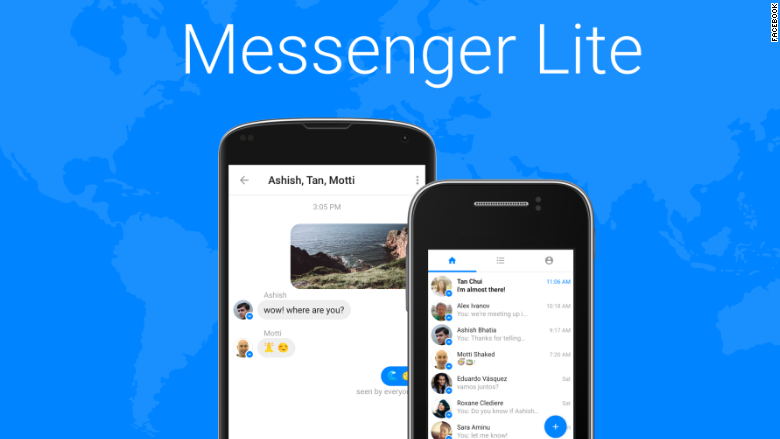 Messenger Lite rolls out Monday in Kenya, Tunisia, Malaysia, Sri Lanka and Venezuela. It will become available in other countries in the coming months. While Messenger Lite will allow users to send text, photos and links to anyone using Messenger or Messenger Lite, it does not include advanced features like audio and video calls found on Messenger. The move is a part of Facebook's greater effort to get more users online worldwide. The company's Internet.org division is also behind the Free Basics app, which provides free internet access to cellphone users in underserved countries. The app gives users access to content topics such as employment and health care information. Facebook (FB) has also invested a lot in messaging apps over the years. In 2014, it acquired WhatsApp for $19 billion and faced frustration from users when it forced its messaging capabilities out of its main app, forcing them to download a separate app. Even as these messaging apps experience tremendous growth -- both apps crossed the billion user mark this year -- some analysts have started to question how or when investors might ever see a return on this investment. Despite Messenger becoming the second most popular iOS app of all time, according to App Annie, it still has no significant source of revenue. "Right now, we aren't focused on monetizing across Messenger, we're just trying to build the best experiences we can for people and businesses," Stan Chudnovsky, Facebook's Head of Product for messaging, tells CNNMoney. While many tech companies have struggled to monetize messaging, some Asian businesses have been more successful. In fact, Line -- a Japanese messaging app which went public earlier this year -- raked in nearly $270 million in revenue from digital stickers last year alone. Facebook hasn't been able to duplicate that sticker success, but it has started to lay the groundwork for monetizing messaging through "bots." The social network hopes customers start interacting with brands via automated conversations through Messenger. In theory, Facebook could start charging businesses to interact with its users on the platform.